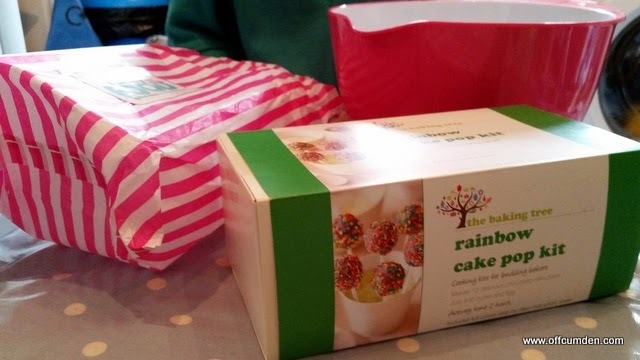 We were recently sent a rainbow cake pop kit from Funky Foods, you can see their website here. 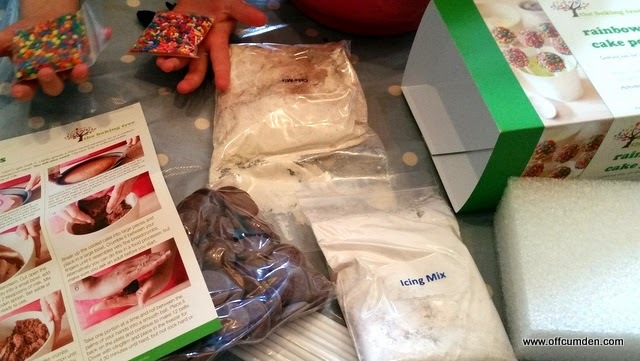 The kit contained almost everything we would need to make cake pops, the only additions being butter and an egg. 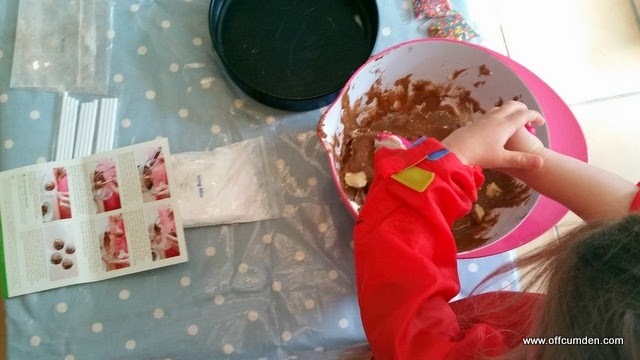 My daughter asked to do some baking one morning before nursery, so I thought this was the perfect kit to do just that with. 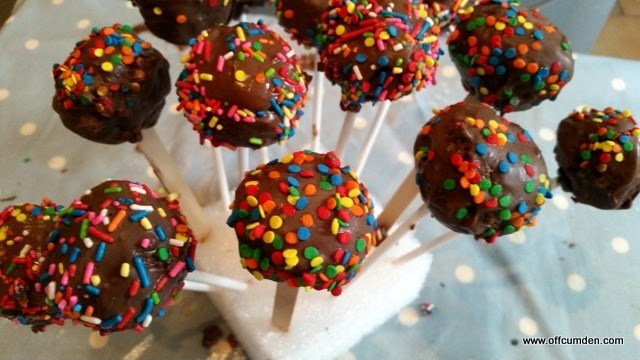 I hadn't ever made cake pops before, but I have always fancied making them. I assumed they would be a bit of a faff to make! We set everything out and took a look at the instructions. It was at this point that I realised that it might take quite a long time to make them. The whole process from start to finish was meant to take over two hours. We got mixing. My daughter did a fantastic job of stirring and beating in the butter. I haven't really baked much with her because university timetables have meant that this year I have been unable to see her as much as before. It was really nice to be doing an activity together. 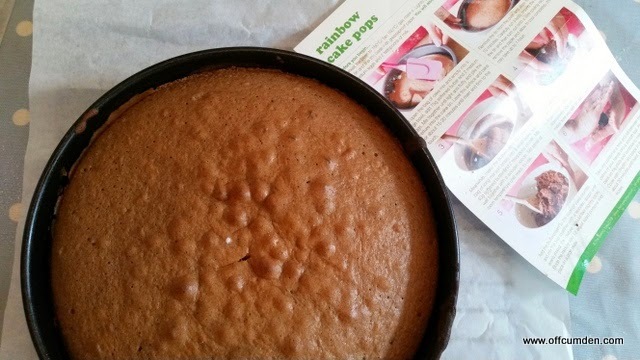 The cake came out of the oven absolutely perfect and we left it to cool down. Once it had cooled down, we then added the buttercream and formed balls on a tray. The tray then had to be put in the freezer, in order for it to cool enough to be usable in the next part of the process. Sadly at this point I had to take my daughter to nursery. When I got home from nursery, I took the balls out of the freezer and followed the instructions to dip them into melted chocolate. The recipe made more balls than I thought it would, so I used some spare lolly sticks for the extras. I enjoyed decorating the cake pops, but found it incredibly hard to slide them into the foam. I would definitely recommend piercing the foam with a skewer or knife before trying to put the cake pop stick in there. I was impressed with the end result, and they tasted really good. They didn't last very long in our house though, which was the only downside! We had great fun making the cake pops. If you are looking for an activity to do with children, then I would advise you to do the first steps alone, and start from the point where you get the rolled up balls out of the freezer. At that stage there is no more waiting about or time for them to get bored. It's also the part which involves the most mess, so is definitely a bonus with most children! The cake pop kit is available from Funky Foods and costs £12.99. We made 15 quite large cake pops with the kit, but I guess that depends on how well your cake rises as to how much cake you have to use. Disclosure: We were sent the rainbow cake pop kit for the purpose of review. This had no impact on my post, which is honest and fair.